The CSH is one of the most important management instruments at GIZ’s disposal to improve sustainability performance at all levels of the company, focusing not only on the company’s ecological footprint, but also on its positive contributions in the four dimensions of sustainability (‘handprint’). Through the data collection process, which covered 100% of country office operations and some aspects of project office operations, the CSH team could assess the status-quo of GIZ Thailand’s current sustainability performance. This assessment served as a basis for the formulation of self-commitments aimed at improving specific sustainability aspects within a 2-year timeframe. The past and current activities include Brown Bag Lunch, beach clean-up on Koh Sak, Chonburi province, composting workshop, home-made bio extract cleaning product, Fun Run for GIZ staff, recycling paper for photocopying, green procurement etc. It facilitates effective sustainability management by enabling country offices to collect key figures relating to indicators and existing sustainability concepts systematically and regularly and to evaluate this data. It helps to conserve resources, increase efficiency and reduce costs. It ensures that the efforts of the GIZ country offices in the field of corporate sustainability are recognised both within the company and externally. It increases competitiveness and helps to attract clients and partners by demonstrating responsible management practices. It helps the company to identify effective strategy options, providing a simple and efficient means of improving the way key sustainability measures are implemented. It encourages the participation of staff members by involving them in corporate sustainability processes. It creates opportunities for mutual learning by promoting the exchange and dissemination of good practices around the world. 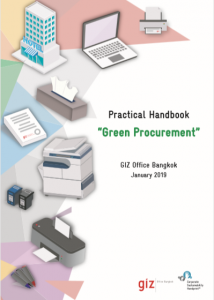 Click here to read GIZ Thailand ‘s Green Procurement Guideline. With this guideline, we contribute to the company’s efforts in increasing its sustainability standards and greening its ecological footprint.